Some people obsess over watches, some over shoes. I obsess over baby monitors. Why, do you ask? Well, my toddler isn’t really the best sleeper, so since he’s tiny, video baby monitors have allowed me to know just how much sleep he’s getting, if he’s okay, and now in toddlerhood, to watch to make sure he hasn’t yet learned to climb out of the crib. They have really given me peace of mind. 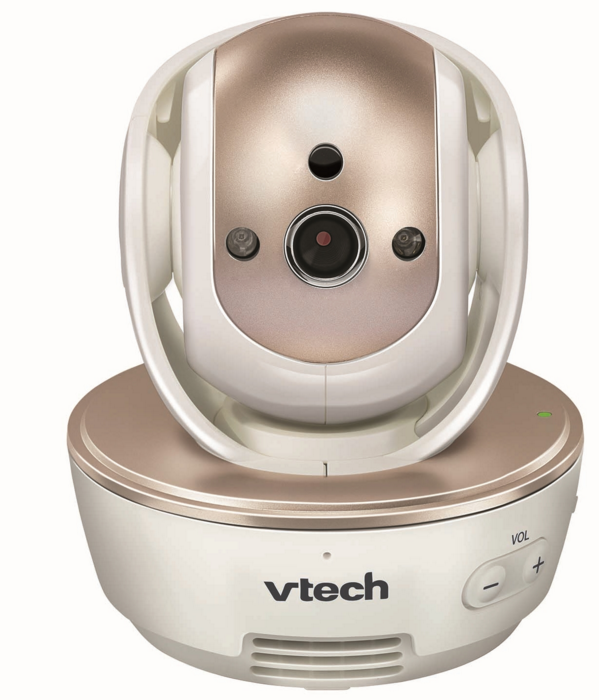 The VM343 Safe&Sound® Pan & Tilt Full Color Video Monitor is just about everything a mama like me can ask for. It’s got a huge full color display, great sound, and amazing reception – perfect for reliably keeping an eye on your little one. Its beautiful design is sleek and modern and will look wonderful in your home. You’ll see crisp, clear images even at night, and you’ll be able to make sure your child gets the recommended amount of sleep. Full motion video of up to 25 frames per second. No more choppy pictures. Includes a talk back intercom so that you can let your child know you’re on the way! M really calms down when I talk to him and let him know that I’m coming to pick him up. You can connect up to four cameras to the single parent unit. That means that you can monitor various rooms at the same time, or keep a camera in various areas for viewing at different times. So, if your tot wanders out of the playroom while you’re watching her, just check up on her on the den camera. 1000 foot range means you may even be able to view your child on a mail run! High res 4.3 inch color LCD screen gives you an amazing picture of your baby! I have had so many times when my camera was accidentally moved slightly out of position. This one can pan up to 270 degrees side-to-side and tilts as many as 120 degrees up and down. That means that you can move it around for the best angle as your child moves around. You can also zoom in for a better view. When it gets dark, ten infrared lights automatically turn on for crystal clear night vision. Parent unit has a vibrating alert. 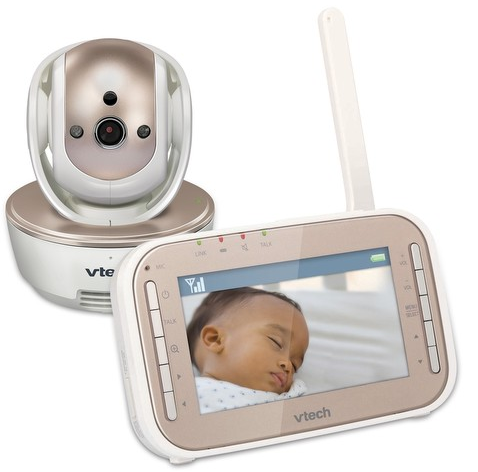 VTech® has really been providing me peace of mind and security with their feature-rich video baby monitors. The VM343 Safe&Sound® Pan & Tilt Full Color Video Monitor is no different – bringing all we expect and need, and then stepping it up a notch. Originally published on 2015-12-15 by Menucha at Mom Blog Society .